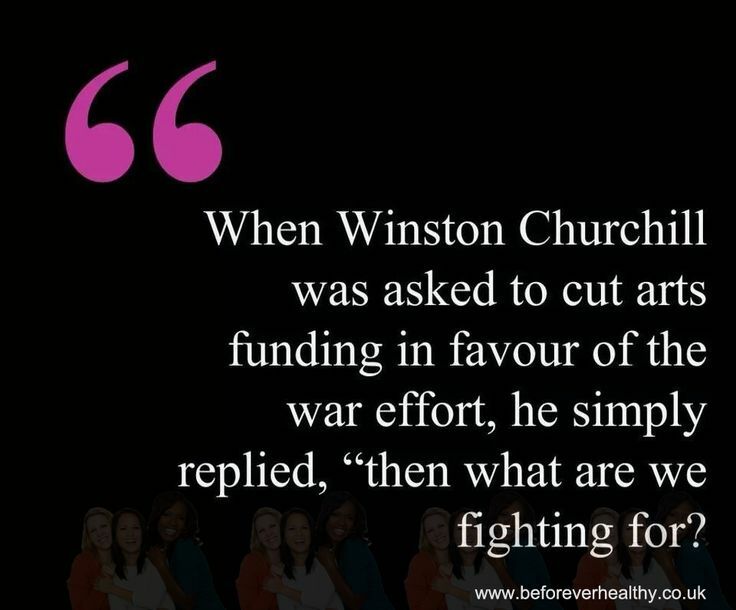 Not surprisingly this quote has again been circulating over the internet in the wake of the Federal Government’s decision to slash A$87m from the arts budget, only a few weeks after its controversial decision to spend A$12 billion on 58 F-35 Joint Strike Fighter aircraft. The quotation, however, is fake. The earliest source for it is apparently an article in The Village Voice from 2008. It is a timely reminder to us all, in this brave new media landscape, of the susceptibility of social media to misinformation. Its frequent reappearance speaks of a deeper longing many of us have. We want the quote to be genuine because we believe the arts indeed do hold out a promise – perhaps in the same way that Churchill’s own life can do for some people – of a higher purpose for our existence. We want to believe in an idea of what it is to be human that goes beyond the merely utilitarian. Or, to use language more familiar to the current political landscape, we wish the arts to help us understand what it is to live in a society not just an economy, what it is to aspire to a quality life, not just a comfortable lifestyle. More immediate motives, however, shaped Joe Hockey’s first budget, in particular his desire to “end to the age of entitlement” and return the budget to surplus. In setting out to realise this economic goal, the arts have been asked to play their part (albeit a very small one given the relative size of the arts portfolio). But was he right to see the arts as just another activity of government that needs to be wound back? This depends, ultimately, upon one’s views of the proper role and limits of the free-market economy. If, for instance you believe the thesis of Michael Sandel, author of What Money Can’t Buy (2012), the answer must categorically be “no”. how we want to live together. Do we want a society where everything is up for sale? Or are there certain moral and civic goods that markets do not honour and money cannot buy? Sandel’s argument is, to be sure, more subtle, and ultimately much more powerful, than a quotation or two here can convey. Essentially, he is arguing that the survival of civil society itself depends upon the cultivation of a sense of ourselves that transcends the limitations of marketplace thinking (and that’s where the arts can play their part). But if our politicians lack the will or the imaginative capacity to argue their case beyond the realm of the economic, these limitations are liable to become hidden from view. Australian consumers (88%) and businesses (74%) overwhelmingly believe Treasurer Joe Hockey’s Federal Budget last night will not benefit them. This suggests the Government’s case for short-term austerity for the greater good has fallen largely on deaf ears. Our sense of self, it seems, is at risk of becoming rather selfish. Are we just “Australian consumers” or do we aspire to be something more? Civil society is premised on the idea of a greater good that connects us all, that we indeed live in a society not just an economy. Tim Thornton is one academic who has argued that part of our problem may lie in the way we educate our economists. For Thomas Piketty, the economist of the moment, the problem lies even deeper: it may be a fault in the very nature of capitalism itself. I would not want to suggest, however, that the arts, like the proverbial Caesar’s wife, are themselves above political suspicion or economic or philosophical interrogation. Indeed, I have strenuously argued on The Conversation and elsewhere that arts institutions themselves must share responsibility for their failure to remain, it seems, something self-evidently “worth fighting for” in our political domain. And it would be a brave commentator indeed who would suggest that there were no justifiable reforms to be made across the arts portfolio. But we elect politicians to be visionary leaders, as well as prudent financial managers, and it is a pity that the current government has confined its political message – in the arts at least – more to the latter quality.